I have officially run out of things to say, which may directly impact your reading pleasure due to a disruption in the post schedule. I am surprised I made it this far before getting this feeling … It’s been a little more than 3 months of me posting every few days. When I thought about starting a blog the first time (3 years ago) I abandoned the idea because I didn’t think I would possibly be able to come up with enough content for a weekly post schedule. But when I decided to take the plunge into the blogosphere 3 months ago I found I had lots of things to say, enough to post almost daily. The beauty of blogging is that you can say whatever is on your mind and hopefully someone will read it, but if it sits unread you’ve still expressed yourself. Right? It doesn’t have to be profound or witty or pithy. But I’ve spent the past week or so wondering about what I have to say. And I realized that the posts I like most are the ones where the topics are closest to my heart or my curiosity or my worries. Now I have to figure out how to deliver my passions – these curious heart worries of mine – in a way that others will relate to or enjoy them. It’s daunting. I’m sure some of you, as fellow bloggers, feel my pain. And for a woman who thought she’d be blogging in oblivion I wasn’t initially concerned about readers. The WordPress world gave me more than I bargained for … it gave me community … it gave me all of you. (Thank you for all the support and love.) Now I carry the weight of disappointing people or “pleasing” people, when I originally thought maybe a few family and friends would even care to read what I had to say. I’m holding out hope that inspiration will come – quickly. 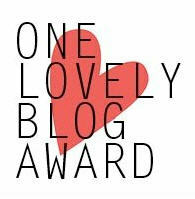 Thank you to my fellow bloggers: Whitney of A Serendipitous Happenstance and Amanda of By Amanda Leigh for nominating me for the One Lovely Blog Award. I am flattered because both blogs inspire and encourage me in my writing journey as they share their journeys. Link back to the blogger who nominated you. Post the blog award image on your page. Tell 7 facts about yourself. Let the nominees know they been chosen. Success and failure incite the same emotions in me: fear and anxiety. Parenting is the single most difficult job I’ve ever had and it’s the only one I won’t ever quit. I recently found two brand new pairs of shoes in my closet. Both are at least two years old and never been worn. Not sure how that happened. This week will find me wearing them. I am a packrat … thankfully my husband is not. And only have my house is cluttered. Please don’t touch me, speak to me, or look at me funny until I am on cup of coffee number two. I am NOT a morning person. I need to ease into my day. Typically, I prefer the book to the movie except for In Her Shoes. My favorite line: “When I feel bad I like to treat myself. Clothes never look any good, food just makes me fatter. Shoes always fit.” So you’ll usually find me in the shoe section not clothing. When I focus on writing things that I perceive will be received well … it creates fear and anxiety. Only I don’t have control over the outcome: Success or Failure. So forgive me if I just create without regard for receptivity. In attempts to share the lovely I won’t be nominating my usual suspects. My favorites are always honorary nominees for me whether I specifically name them for an award or not. You can see them in my blogroll and they are definitely worth the visit. Congratulations to the nominees! Share the lovely! Forgive me because I feel like I need to provide some background. I decided almost a year ago to write a novel. Finally. I was so optimistic. August 31, 2012 was my projected end date. The goal was 90,000 words. My reasoning: if NaNoWriMo participants could produce 50,000 words in 30 days, surely I could achieve my word count goal in one year. It didn’t matter that I hadn’t written creatively in years. It didn’t matter that I didn’t have training or education in the discipline of writing. All I had was an idea and a desire, which should be more than enough for a writer to get started. Shortly after beginning, I decided that I needed an accountability partner. I have two writing partners that encourage me. I’ve allowed them to read segments of my novel in progress, which at times could be called a novel interrupted. However, the idea of letting others read what I’ve scratched out makes me nauseous. Go to the 7th or 77th page of your work in progress. 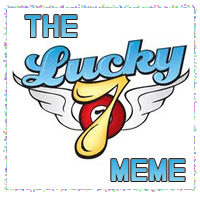 Go to the 7th line of the page. Copy the next 7 sentences or paragraphs. Remember, they must be as they are typed. Let them know they’re it. Here’s me … taking a leap … an excerpt of my novel. I am not brave enough for seven paragraphs. Not yet. The working title, based on the initial idea and summary: Momma’s Heels, which has morphed into so much more than I expected. “The summer where she could rid herself of this stupid nickname and take on her given name, which is very grown up. Being treated as a grown up is her definition of happiness. But as the summer comes to a close she can feel that happiness has been absent from the season. I appreciate fellow blogger and author: Whitney of A Serendipitous Happenstance for helping me take this leap in sharing my work with a broader audience, even if only a small snapshot. Her excerpt for her novel, Rain, will have you hooked and wanting more. Don’t miss your chance. Check it out. For almost a year, I’ve been searching for new ways to express gratitude. I’ve learned a lot but most importantly, I’ve learned that a simply saying thank you is enough. 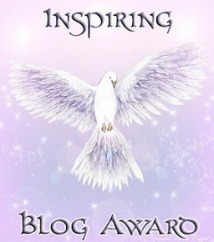 Thank you to my blog world friend Whitney of A Serendipitous Happenstance for nominating me for the Inspiring Blog Award. Congratulations to you for receiving this award as you well deserve it. Your blog is an inspiration to me as I work on my writing journey. I am glad that it’s reciprocal. I have a pile of unfinished projects and crafts next to my bed. I commit to completing one of them by the end of the year in addition to everything else I am trying to do. I am still uncomfortable in my own skin but I’m working on it. When I travel, I always over pack but I never know what I’ll need. I only use a quarter of the stuff. This summer I dedicated time to gaining wisdom so I am studying the book of Proverbs. I am starting an electronic/gadget diet i.e. less time plugged in. Moderation. Maybe I can accomplish more if I unplug for a bit. My goals are often lofty and my follow through lacking. But it doesn’t stop me from trying to have it all. My favorite pens are BIC Cristal Bold and now they come in colors other than blue and black which makes me happier than it should. Congratulations to all bloggers who inspire others with their words. Last week before I left on vacation I was surprised to receive nomination for the Versatile Blogger award. First I must apologize to Jenni of newsoftime.org for taking so long to respond. It’s not because I wasn’t excited. I am truly honored to be recognized by someone whose blog I admire. Accepting praise and recognition can be difficult; especially without qualifying it with statements like, “Oh you shouldn’t have,” and “I don’t deserve it.” I find myself in that difficult place right now. But I will say thank you without adding a qualifier. To Jenni of newsoftime.org, I say a special thanks for the kind words and encouragement. Your blog inspires me to stay informed. You share thought provoking topics that are in the news in an engaging way. One day I will find the courage to jump into the discussions. For now, I will continue to hit like. If you’re nominated, you’ve been awarded The Versatile Blogger Award. Thank the person who gave you this award including a link to their blog. Nominate those 15 bloggers for The Versatile Blogger Award – you might include a link to this site. Finally, tell the person who nominated you, 7 things about yourself. Zen Scribbles – Exploring books and lots of reading. Kanika Starr Reynolds – Inspiration and faith. She’s in the process of revamping but you should check it out. JudySP – A journey in writing and reading. Ashelyjillian – A writer’s multifaceted life. The Unorthodox Epicure – Funny food stories and recipes. Coco Ginger Says – Thoughts about what’s going on in her life. Texana’s Kitchen – Recipes with great stories. Blah Blah Blog – Helpful hints on grammar (which I can always use). This Unexpected Life – A mom’s journey in life and faith. Burris Blunders – Personal stories of life and faith. iGameMom – Recommendations and information for parents of gamers. Cristian Mihaid – A journey in writing. Betweenfearandlove – A writer sharing her work. Bravo to you all for giving me wonderful things to read. I am a creature of habit and not in a good way. It’s hard for me to talk about or promote myself, despite the fact that I put my life out there on a blog. If I could travel any where without worrying about money, I would go to Spain, Greece, Italy, Buenos Aires, and Australia. This year is about deepening relationships but I am still figuring out what that means. I am a writer who is working on her skill in hopes that it will one day match my desire. I am an introvert. My next non-fiction read will be Quiet: The Power of Introverts in a World that Can’t Stop Talking by Susan Cain. I love the support and sense of community that exists for bloggers and writers. Thank you again to Jenni. I consider it a privilege. Thank you so much to goodoldgirl for the nomination. I was surprised and humbled when I received word that you’d passed this on to me. When I started blogging a couple of months ago I thought that the people who would read my blog were friends and family. I thought that it would be a way to reveal more of who I am to the people who already love me. Thank the one who nominated you by linking back. Nominate five blogs with less than 200 followers. Let your nominees know by leaving a comment on their sites. Add the award image to your site. Again, a big thank you to goodoldgirl who’s blog feels like the comfort of home and makes me introspective. Thank you so much for the recognition. I am truly humbled and honored for the acknowledgement.